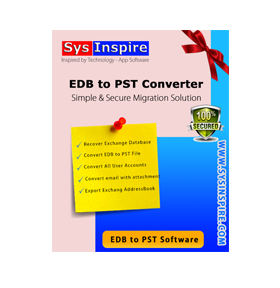 Exchange EDB to PST Conversion Software designed to recover exchange server database .edb files and export exchange edb to pst file with all mailboxes. 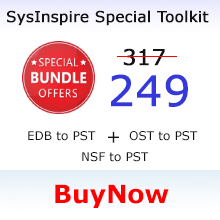 SysInspire EDB to PST Converter Software helps to read exchange mailboxes and convert edb to pst file. 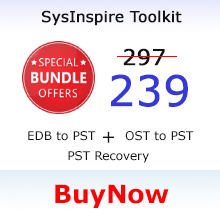 Get SysInspire OST to PST Converter Software and quickly repair OST file in single mouse click. Advance technology driven OST to PST Conversion tool scans larger OST files in seconds and gives the opportunity to export OST to PST, EML, MSG, MBOX, VCF, CSV and many more formats. Download Lotus Notes to Outlook Converter Software and recover nsf file data easily and quickly. 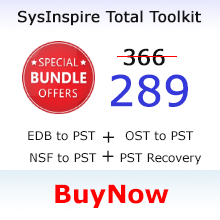 Notes Names.nsf file recovery is now possible with SysInspire NSF to PST Converter Software. The tool perfectly works on latest version of Lotus Notes database file. 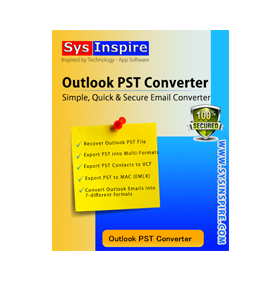 Outlook PST Converter software gives multiple conversion options to convert PST file. Easy to open PST file and export PST to PST, EML, MSG, MBOX, EMLX, HTML and vCard file format. SysInspire EML to MSG Conversion software has extra powerful feature based eml conversion program. Within software, user can preview the EML message content with attachment and export EML to MSG file with all embedded images, attachments, styles etc. Powerful Excel Password Recovery Master helps to reveal excel password even when user forgot their excel open password and excel worksheet password. Software speedly search original excel file password and unlock excel file. The demo version of Excel Password Unlocker allows to reveal first 3 character password.